People who take MDMA, a common recreational drug which is also known as Molly or ecstasy, feel a sensation of elation and the urge to connect with others. Now, a fascinating new study suggests that this applies to octopuses too, despite the fact that we’re separated by 500 million years of evolution. California two-spot octopus (O. bimaculoides). Credit: Thomas Kleindinst. MDMA acts by increasing the activity of three neurotransmitters in the central nervous system: serotonin, dopamine, and norepinephrine. The emotional and pro-social effects of MDMA are likely caused directly or indirectly by the release of large amounts of serotonin, which influences mood (as well as other functions such as appetite and sleep). Serotonin also triggers the release of the hormones oxytocin and vasopressin, which play important roles in love, trust, sexual arousal, and other social experiences. Gul Dolen, an Assistant Professor of neuroscience at Johns Hopkins University, along with colleagues, studied the California two-spot octopus (Octopus bimaculoides), a species that is less challenging to work with in laboratory conditions. It’s also the only octopus to have its genome fully sequenced, allowing the researchers to make a gene-by-gene comparison with the human genome. 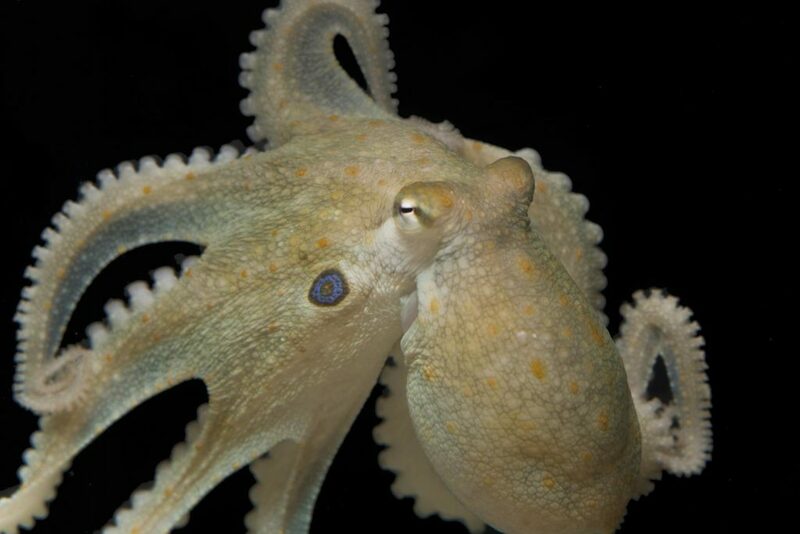 Researchers gave some octopuses a dose of MDMA and then studied their behavior. What they saw surprised them, considering the solitary nature of O. bimaculoides. Individuals under the influence of the drug spent more time with other octopuses, both male and female. The most striking behavior, however, was that they engaged in extensive ventral surface contact — in other words, they were very touchy-feely. The typically rare physical contact between the octopuses was non-violent and more exploratory in nature. These findings show that O. bimaculoides share the same serotonin transporter gene with humans, which is known to serve as the principal binding site of MDMA. So it seems like this is an ancient neurotransmitter system shared across vertebrate and invertebrate species, which evolved hundreds of millions of years ago. Of course, the serotonin system did not evolve to get creatures high but rather to enable complex social behaviors. For instance, the octopus may rely on this common pathway to behave socially during the mating season. In the future, the researchers plan on sequencing the genomes of two other species of octopus, which are closely related to each other but differ in their behaviors. This way, they hope to gain more insight into the evolution of social behavior.